In our dedication to helping you end your skin breakouts, whether they’re on your face or scalp, we’re listing down the best shampoos for oily acne prone scalp in this article. We’ve spent a lot of hours and went through 20 different products to make sure that we only bring the best ones to the table. They were ranked based on their ingredients, ability to control oil and acne-preventing properties. If you are looking for something organic, Naked Bee Orange Blossom Honey Shampoo and Conditioner is highly recommended. It can get rid of the dirt and excess oil on your scalp without leaving it dry. It does have an orange blossom scent. It can be refreshing or too harsh, depending on your nose's tolerance. Neutrogena T/Sal Therapeutic Scalp Acne Shampoo contains salicylic acid. It's medicated and created specifically for people struggling with scalp acne. It's meant to be used a couple of times a week. To avoid the associated dryness, you can follow it up with a non-oily conditioner. Maple Holistic Degrease can’t only cleanse your hair and scalp. It can also minimize the size of the pores on your scalp as well as bring back its natural pH. 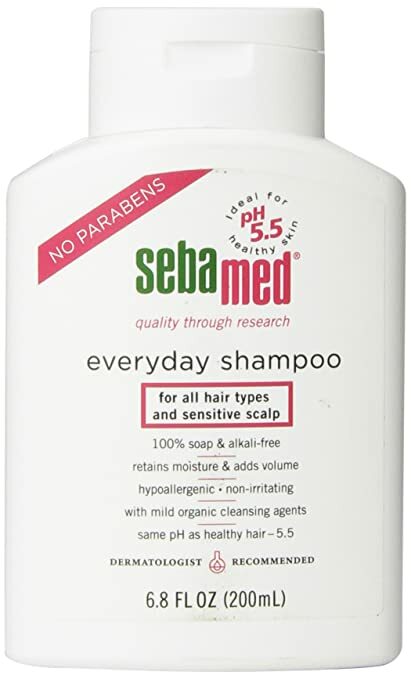 Sebamed Everyday Shampoo is a good choice when it comes to scalp acne since it doesn't disrupt the scalp's natural pH and balance. It can leave your hair softer and your scalp moisturized. Its scent, however, can be a major con for some people. Anti-B Antibacterial Shampoo has the ability to soothe inflammation as well as any redness. It does a good job in relieving itch, too. Naked Bee Orange Blossom Honey Shampoo and Conditioner is perfect for people who like multi-purpose products. Since the product already has cleansing and moisturizing properties, you’ll only need to keep one bottle with you while you shower. Although convenient, this combination might not be enough, particularly if you have dry hair. Some of its customers actually think that there’s not enough conditioner in the formulation. As a solution, you can try leaving it on your hair longer to give this shampoo and conditioner combo enough time to do its magic. The product is non-comedogenic and made with 70% organic ingredients. It’s hypoallergenic, too. It has organic aloe vera, honey and spirulina. These ingredients are great in nourishing the scalp while leaving the hair shiny and healthy. As a shampoo, it lathers well but not as much as commercial shampoos. It has a nice scent, too. Neutrogena T/Sal Therapeutic Scalp Acne Shampoo is a medicated shampoo containing 3% salicylic acid. It’s initially created to help treat seborrheic dermatitis and psoriasis. This Neutrogena acne shampoo has no fragrance or preservatives. It’s thick in consistency and clear in color. It’s recommended to use the product three times a week. It can, however, be used every day but you must anticipate getting dry hair with that. To keep your hair moisturized, you can use a non-oily conditioner after. Another good tip is to keep the product to your scalp where it’s most needed. Oily and greasy hair are two things that can easily trigger acne. To make sure that doesn’t happen to you, try Maple Holistic Degrease. It contains lemon essential oil to to restore your scalp’s natural sebum and pH. It can also alleviate itch and hydrate your hair follicles. One of the nice things this shampoo can do is minimize large pores. This can help prevent clogging, which often ends up in scalp breakouts. The product contains all natural ingredients. It doesn’t have sulfates, parabens and silicone. Its hypoallergenic formula can work well for those with sensitive skin, too. Take note, however, that the product is formulated for cleansing and not conditioning. If you have thick and frizzy hair, you might want to invest in a good condition. But, make sure you only condition the ends. Applying conditioner on your scalp can lead to product buildup which can clog your pores. Sebamed Everyday Shampoo contains mild organic cleansing agents. It claims to be gentle enough to be used on almost all skin types- including sensitive skin. What makes it great for acne prone scalp is that it’s free from alkaline. This ingredient is known to disrupt the scalp’s natural barrier. When your scalp’s barrier becomes imbalanced, it gets inflamed and sensitive. These factors can give you spots. Now, what this product does is that it cleanses your scalp without stripping its natural oil. It’s able to keep your scalp’s moisture and can even add volume to your hair. It claims to have a pH of 5.5 which matches the pH of your hair and scalp which is at 4.5 to 5.5. It lathers well once massaged on wet hair. Despite leaving a squeaky clean feel to your hair, you’ll get noticeably softer hair once it’s dried up. The shampoo does contain a mild scent, which some users likened to the fragrance of hair colorants. It tends to stick even after a few hours. Anti-B Antibacterial Shampoo contains lemon essential oil, witch hazel and aloe vera. The combination of these ingredients make the product highly effective in inhibiting bacterial growth as well as tone down inflammation. The shampoo also works well in soothing any itching and redness. It works to replenish vitamins, too. The product contains no sulfates, which make it a good match even for those with sensitive skin. It does, however, have a subtle lemon scent. Although it isn’t that overpowering, it’s something you have to consider, particularly if you have a really sensitive sense of smell. Take note that it can potentially dry out your hair. To remedy this, make sure you have a quality conditioner around. Have you ever heard of Pomade Acne? Don’t laugh. It’s actually a thing- a pretty common thing. Much like how pomade can cause acne, using the wrong shampoo can also trigger breakouts in your skin. Acne, as we all know, is caused by a lot of factors. Just think about clogged pores, dirt and excess oil. And your hair products count, too. When you use a shampoo, it’s not enough that you consider its scent or its ability to lather on your hair. More than the cleaning properties of shampoos, you should also be conscious of their ingredients. Your scalp, much like the skin on your face, can react negatively when exposed to the wrong products. Here are some of the things you need to keep in mind when picking the best shampoo for acne prone scalp. When a hair product or shampoo is made from organic ingredients, there’s a good chance that it doesn’t contain any preservatives or chemicals that can irritate your skin. In fact, most organic ingredients have properties that can help address your scalp acne. Tea tree, for example, has antibacterial properties that can help get rid of the bacteria on your scalp. Other great natural ingredients for scalp acne are aloe vera and green tea. Sulfate is typically added to shampoos and soaps to increase these products’ foaming properties. Although it helps them lather up well, it’s actually a nasty ingredient. It can cause irritation, dryness and stinging when it comes in contact with your eyes. Sulfate can also aggravate any existing scalp condition you may have. Recognizing silicone ingredients in your shampoo can be a bit difficult, particularly if you’re not familiar with them. As a basic rule, you should look out for ingredients that end with “-cone”- like cyclomethicone. Not all silicone ingredients are bad for your skin. Those that aren’t water soluble tend to leave residues on your skin and scalp that can contribute to scalp acne. In short, you have to stick with silicones that are water soluble so that when you rinse off your shampoo, there won’t be any product left to clog your pores or irritate your scalp. One good tip is to look for silicones that start with PEG. Hydroxypropyl Polysiloxane and Lauryl Methicone Copolyol are good, too. Wash your hair every other day to preserve its natural oils. If you have oily scalp or you use too much hair products, wash your hair every day. Avoid wearing tight hair accessories. Try to avoid scratching your scalp, especially with dirty fingers and nails. Find a way to relieve stress and anxiety. Use products containing salicylic acid or glycolic acid to provide mild exfoliation on your scalp. There are a lot of factors that can cause scalp acne. Remember, it’s not just your shampoo. However, if you want to avoid further breakouts, you should consider replacing your shampoo, particularly if it isn’t doing any good for your scalp. For this list, we’re considering Naked Bee Orange Blossom Honey Shampoo and Conditioner as the best shampoo for acne prone scalp. It does a great job in cleansing scalp and preventing breakouts- all without drying your hair out.